The family-friendly ski hotel is situated on 40 hectares in the heart of the White Mountains of North Conway, providing stunning views of the resort and surrounding area. 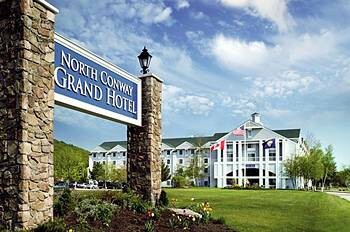 It is built adjacent to New Hampshire's largest tax-free shopping outlet centre. The club resort is conveniently located just a short drive from both Nordic and alpine ski areas. Cranmore Mountain is a 10-minute drive away, Attitash and Story Land are both 15 minutes away by car and the Black Mountain ski area is approximately 20 minutes' drive from the hotel.FacilitiesThe hotel features 200 accommodation units. Guests of the hotel are welcomed in the lobby, which has a 24-hour reception and a 24-hour check-out service. Lift access is provided to the upper floors. Amenities include a cloakroom and a safe. Internet access and wireless internet access (no extra charge) are available in the public areas. Gastronomic options offered by the hotel include a restaurant, a café and a bar. Guests can visit the supermarket to purchase daily necessities. Shopping facilities are available. The grounds of the hotel feature a playground and an attractive garden. Additional features of the hotel include a newspaper stand and a playroom. Guests arriving in their own vehicles can park in the car park. Guests can also use the bicycle storage facilities. Facilities include a laundry. A bicycle hire service gives guests the opportunity to explore the surrounding area independently.RoomsAll rooms feature air conditioning, central heating and a bathroom. Bathrooms with wheelchair access can also be booked. The carpeted accommodation units feature a double bed or a king-size bed. A safe is also available. The accommodation units offer a range of amenities, including tea and coffee making equipment. An ironing set is also available to guests. Additional features, including internet access, a telephone, a TV, a radio, a stereo system, a DVD player and a games console, contribute to a great stay. Wheelchair-accessible rooms are also bookable. In each of the bathrooms, guests will find a shower, a bathtub and a hairdryer. Personal care items can also be found in the bathrooms.Sports/EntertainmentA refreshing dip in the indoor or outdoor pool can be pleasantly cooling on hot days. Sun loungers and parasols offer the ideal way to unwind. A hot tub provides an opportunity for relaxation. Leisure options at the hotel include a gym, a spa and a sauna. For a fee, cycling/mountain biking, tennis and volleyball are also available. Additional services include an entertainment programme for children (for a fee), offering numerous activities. MealsThe hotel offers the following bookable meals and board options: breakfast, lunch and dinner. The hotel additionally offers special deals.PaymentAll major credit cards, including American Express, VISA, Diners Club and MasterCard, are accepted for payment.